It’s all too easy to get into the habit of simply sending out the same CV whenever you see a job that takes your fancy. Perhaps when the world was in the boom time that was enough to secure an interview, but now that there are far fewer jobs available, it’s important that you do everything you can to make your application stand out. It can be very hard to be objective about your own CV, so the best thing to do is get a trusted friend that is an expert in recruitment or HR to have a look and tell you where you can make improvements. If you don’t have such a friend, never fear, because the following advice will be just as good! Print out a copy of your CV exactly as you’d send it out. Without actually reading the words, look at the layout from a visual perspective and see if it comes across in a pleasant manner. It is well spaced? Is the type face easy to read? Is there loads of blank space at the end rather than a carefully laid out CV? Far too many people waste the initial impact area of their CV – the top couple of inches of the first page – by spending too long on their name and address. A great way to upgrade your CV is to simply have a bar along the top with your name, mobile number and email address. It’s really all you need and you can have your address with your personal information on the last page instead. It saves space and helps you to impress more quickly. Now you’ve gained more space in the area that recruiters will see first, make it count! Write a profile that promotes you without waffling or showing off. It’s all about best foot forward – say that you’ve been ‘regularly promoted’, or what languages you speak, or that you have ‘increased your department turnover by x%’ or about the measures that you have introduced have increased productivity. Always quantify your achievements. Try to show something of your personality rather than falling into clichéd CV language. Look at how you’ve described your career history and see where you’re repeating yourself or giving unquantified information. Don’t give obvious detail but do explain where you’ve gone beyond your job description. Be careful not to just write about what you did on a day to day basis without showing how this benefited the company, your clients or the projects you were involved with. Don’t repeat lots of jobs in the same company as it will take up too much space – condense them while showing that you have progressed and are loyal. Similarly, you don’t have to list every job you’ve ever had – unless you’re a recent graduate don’t write about any jobs before you left university, unless they were particularly pertinent to your current quest. Listing all your GCSEs is an easy mistake to make on your CV, but it’s really unnecessary and wastes space where you could be showing more relevant skills. Just say 10 GCSEs from A-C or whatever. You need not list all training courses either unless they’re very relevant – just put the ones that are most pertinent. And don’t write about your dissertation! Since you’ve taken your address off the top of the first page, add it at the end in a section marked ‘Personal Information’. An important change to make is to take off anything that is too personal such as details of your marital status, number/names/ages of children, religious beliefs, political beliefs or anything about social standing. Sports are fine, as are musical tastes, although be careful not to list anything that hints at your political or religious beliefs unless it is relevant to the job. 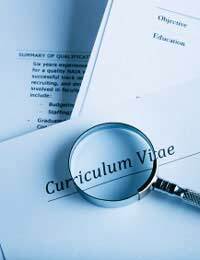 Once you’ve reassessed your CV, print it out again and check that it looks good. Email it to yourself to see how it will be received by potential employers and make sure your full name is the saved file name to avoid confusion. Good luck!